Student Affairs – Tedium is the worst boredom. I have a blog, so I’m required by law to say something about the YikYak controversy swirling around the National Association of Student Personnel Administrators (NASPA) National Convention. 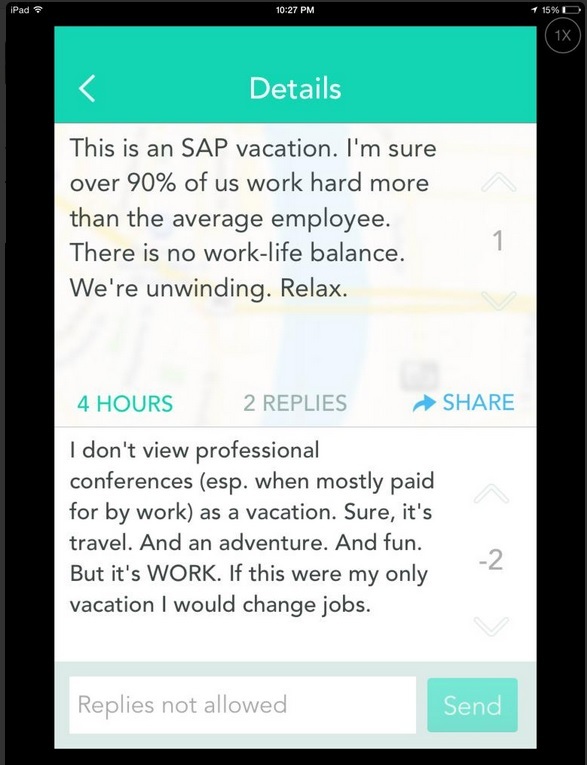 When comments like this were seen on yik yak, other administrators modeled the way and called out the behavior.They shared what they felt were community norms and shared community values. Administrators monitored their own community. They are and were demonstrating they very bystander intervention behaviors we claim to teach. Sure, there are plenty of people who are screaming “moral high horse” and accusing people of being “sanctimonious.” But isn’t this what we’ve trained our students for? Isn’t this exactly what we said would happen? Isn’t this exactly what we want? A year ago today, I covered my office window with blank post-it notes. 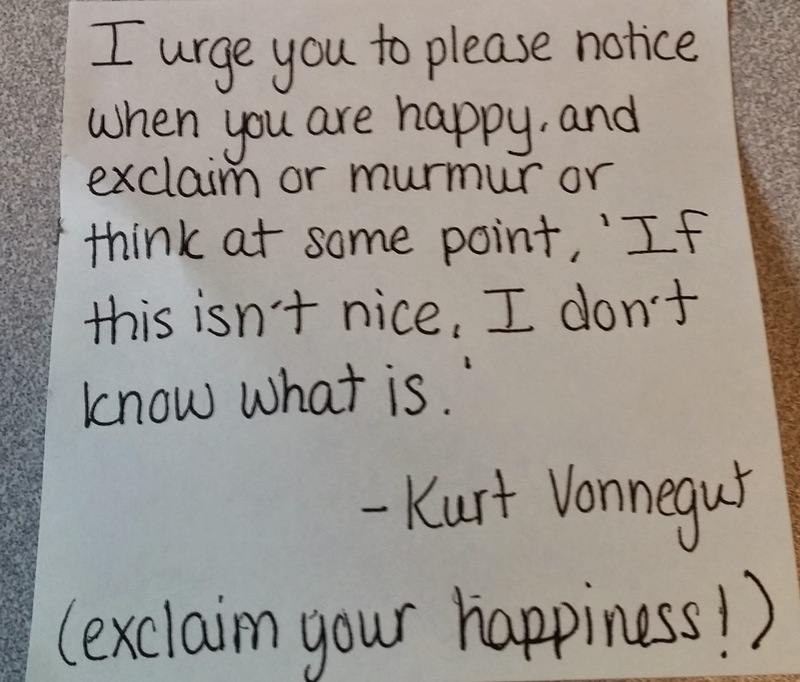 Many of you followed this activity via an earlier blog post – Post-It Project 2014. My hope was students and staff would stop by, share a note of positivity and inspiration and then anyone could take a note as needed. One year later, it’s time to look at some of my favorites notes that went unclaimed this year. I’m not certain I expected a drastic change in myself over the course of the year, but I spent a year looking at notes like this. 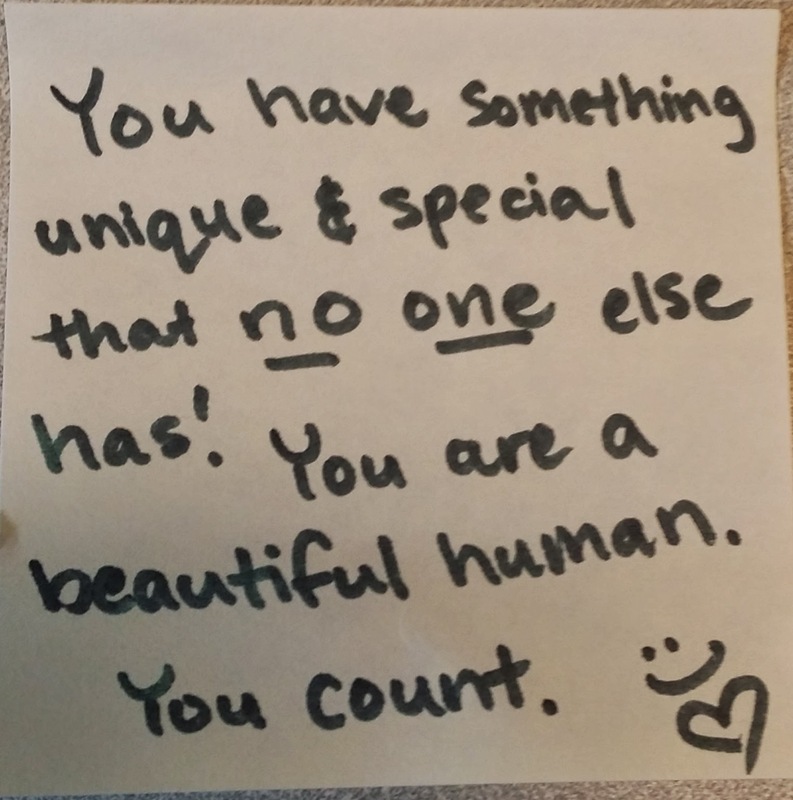 I spent a year of students and staff members silently walking into my office, taking a post-it note and leaving. 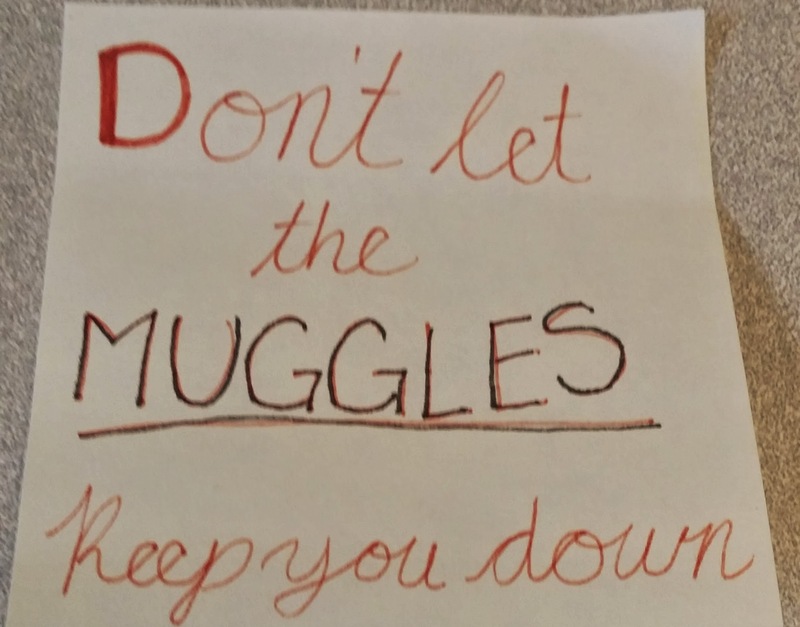 I spent a year of students and staff walking into my office laughing, writing a note of positivity and leaving. I spent a year of students talking about why sharing positive news was important. I spent a year thinking about happiness, light and laughter. It wasn’t an easy year – but whenever I needed it most, there was light coming from my window. I haven’t put any post-it notes on my window yet… and I might not. For once, I like seeing actual light come through my window. As another work year comes to a close, I wish you and your loved ones nothing but light. Sometimes it’s the littlest gestures that mean the most. I’m proud to work at one of the most LGBT-friendly colleges in the country. Because of this, colleagues frequently ask what we do to be so inclusive. It’s the little things. We don’t do it once. We do it all of the time. We don’t do it with just new students. We do it with all students. This isn’t an introduction but a continued dialogue. Let your students share their chosen name and prefered gender pronouns. Don’t make it a big deal. Just make it a normalized behavior. Sure, it might feel funny to you to say something that might be obvious if you’re a cis-gendered individual… but for those who identify as trans, gender queer or non-gender normative, it gives them an opportunity to proclaim who they are in a safe and non-threatening way. Besides, knowing someone’s prefered gender pronoun is far more helpful to know than what their favorite ice cream is or their favorite Disney movie or their spirit animal. A week of veganism is in the books and I survived. Me, the king of bacon and steak frites, lover of ice cream and red dye #40 survived a week of being vegan. It wasn’t always easy. To prove a point, I ate most of my meals in dining facilities of the college I work at (Emerson College, for those of you who haven’t picked up on that yet). There were good days and bad. Day #1 on my own was good. I was in control. Day #2 in the main dining hall was good. Options were limited, but I was okay. But then, there was Day #3 where we tried to eat in an auxiliary dining unit (“The Max”). Upon arrival for breakfast, it was clear that this would be a difficult day. We had the option of a banana or an apple. Nothing was vegan. Nothing in the grab and go was vegan. There was chance for cross contamination at nearly every station. There were no options for me to eat here. If I lived in this building and had to eat here, I would be out of my mind angry. I would be so frustrated. And truthfully, I stayed as true to the experiment as I could… so I went pretty hungry on Wednesday/Day #3. That’s when it happened. I was hungry. I was irritable. I was difficult. I found myself unable to articulate by the end of the night. If a student is hungry, how can you expect them to learn? How can you expect them to be successful in a high stress environment? Yes, you’ll say that my body was adjusting to veganism… but how many students decide to take up a difficult diet with little research. Anything I knew I found by googling or asking friends. There was no literature to assist a student looking to maintain a diet like this. Luckily, Day #4 was back in the dining hall. I knew I would be okay (despite having basically the same meals that I had two days prior), but I still wasn’t getting the caloric intake my body required. I still wasn’t getting the nutrition I needed. It impacted my stomach, my wellness, my temperament and other areas. But, I finished out with style on my own on Day #5 and have been slowly integrating dairy and meat into my diet. I skipped meat totally on Saturday and had some on Sunday. It’s a life choice I can’t sustain, but it’s something I can partially integrate. I could easily maintain a Meatless Monday, or a Vegan Tuesday. My cravings for candy is substantially less. Today’s college students don’t advocate for their own dietary needs. When they don’t see options for their diets, do they introduce themselves to a dining manager and see about a fix? For the most part, no. They just complain to administration or a family member. If a dining manager knew, they could assist in a meaningful way. All of the dining managers I met would love to interact with students in this way. Today’s college students don’t have the variety needed for sustainable dietary restriction. If they’re going to be successful at a vegan lifestyle, it isn’t fair to force them to have the same rice/noodle bowl for lunch and dinner every day. Cross contamination is and will always be a problem. Students aren’t thoughtful. They’ll stick a butter knife in a container of peanut butter, tainting it with dairy and making it non-vegan. They’re not being malicious, they’re just being thoughtless. When you’re in a small space (like Emerson), its hard to have separate grills/fry stations, which creates cross-contamination. Some of the auxiliary units don’t have the spatial capacity to have a vegan or kosher station. They’ll never have the capacity. Chances are the dining administration at your college would be willing to listen to your feedback and concern… just like the team at Emerson Dining. They were wonderful dining companions last week and took a great interest in this project. I’m so happy to see them engaging and can’t wait to see what they do with it. It will certainly better our entire community. That said, I need a milkshake. And a maple bacon donut. As we embarked on the dining challenge, I knew I’d have highs and lows while eating as a vegan on campus. There would be easy moments, frustrating moments, bewildering moments and things that had never occurred to me before. Yesterday was mostly good. As Team Vegan (there are three of us) wandered into the dining hall for breakfast, I wondered if it would be awkward to ask questions. Putting myself into the shoes of a new student, I wondered if I would be confident enough to ask about vegan options. Luckily, foods were clearly labeled for both ingredients and allergy warnings. There was really no need to ask questions because everything was well labeled and easy to find. Unluckily, there weren’t a lot of options for breakfast. Seeing the breakfast treats made me the saddest. 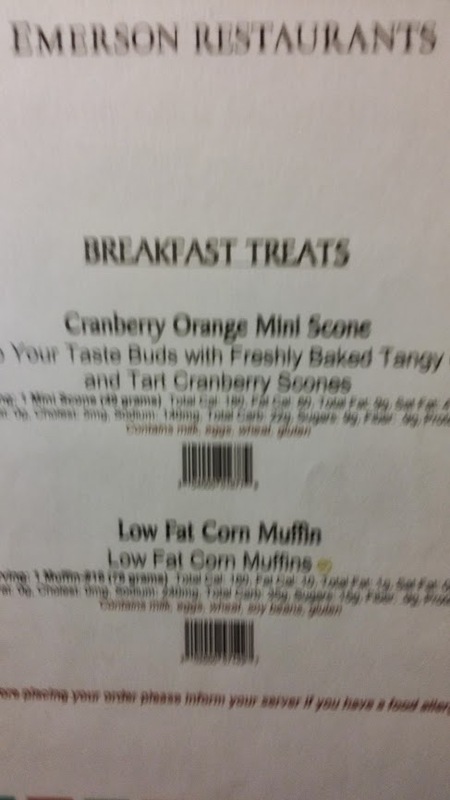 I WANT CRANBERRY ORANGE MINI SCONES! They looked so tasty, but alas… totally not vegan. There was only one vegan cereal available, oatmeal (with no butter or sugar) and fruit. We were lucky to have soy milk, both in vanilla and chocolate flavors. Watching Team Vegetarian chow down on custom made omelettes and Team Gluten-Free eat plates of bacon, we felt a little slighted in our offerings. There just weren’t a lot of options, but at least we had some options. There was something. 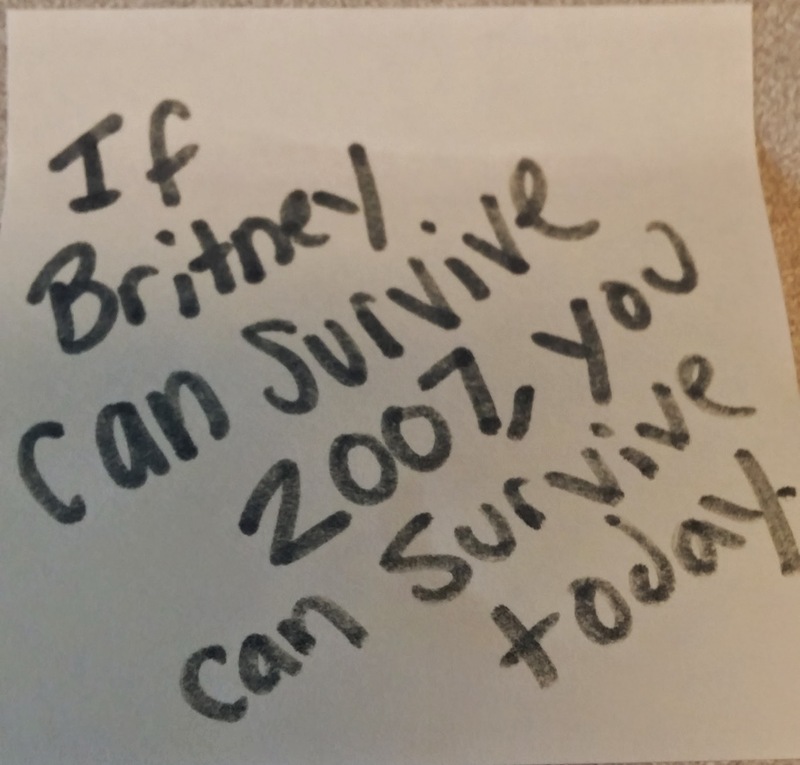 Luckily, things turned around at lunch. I was quite pleased to see a separate vegan station at the front of the dining hall featuring cooked to order rice noodle bowls. Tons of fresh veggies (most of which are locally sourced), tasty sauces and tofu. For someone who doesn’t love veggies, I was very happy. I was especially happy to see this as a separate station, which limits the possibility of cross contamination, which is a huge concern for many of our students. There were also several vegan items throughout the dining hall, from pasta with basil marinara to vegan chicken nuggets. You weren’t forced to only eat salads which is something I anticipated having to do. Also, I was thrilled to see a vegan banana bread. I love dessert and I was relieved not to be left out. The other thing that I loved… there was a smoothie station. You put fruit, ice and juice into a blender, hop onto a stationary bike and pedal away. The faster you pedal, the faster the blender goes! We got some good exercise and made some healthy vegan snacks. Last night, I met a friend for the infamous TACO TUESDAY and managed to do quite well in my vegan efforts. I had plantain tacos with a banana ketchup sauce. Good stuff, indeed. It isn’t as hard as I anticipated, but in no way is this a walk in the park. My only problem… apparently my body is fighting this. My stomach is weird. It grumbles and makes noises. It’s very odd and slightly uncomfortable but we are moving forward! Excited to share the results of today’s efforts soon. Food privilege. It’s a thing. As a meat-loving carnivore, I knew I would never go hungry eating in the cafeteria where I went to college. It never crossed my mind that having diverse selection of foods to choose from was a privilege. As someone with no religious leanings, I never had a dietary restriction due to my religion. It never applied to me. A few weeks ago, a parent of a student shared an article that changed the way I thought about food. Students, staff, faculty and administrators followed the diet many young people live by… vegan, vegetarian, gluten-free, dairy-free. Eating on campus is easy if you have no restrictions. But the minute you have to think about what you’re consuming, things become more difficult. I never put myself in these students dietary shoes. I never thought about their day to day eating lives. Will I go hungry as a vegan? Will I be frustrated by selection? Will I get enough protein? Will dining staff be knowledgeable about what is vegan? I’ll have a few more questions in the preceding days… never mind what my body is going to do with a significant diet change. I’m proud of our dining operations for being willing to support this challenge. Dining staff have already been joining us for our meals, taking notes and responding positively to experiences and feedback. In the upcoming days, I’ll be sharing specific stories and experiences of my life as a vegan. I hope you’ll join me!